UK Drummers available for any occasion! Weddings, Partys, Birthdays, Jaggos, Mehndi and any other special occasions. We can perform in Leicester and surrounding areas. He became a big fan of the dhol several years ago when he first saw a dhol performance video by Raju Johal (A highly skilled dholi). However Aman never had a chance to learn the instrument because he didn’t come across anyone who taught it. But back in Autumn 2013 he decided to start learning the Instrument. He purchased his first Dhol and after some months of daily practice, he made a good start to learning the basic beats. Eventually he started learning the Dhol at a deeper level with the help of the Manager of the well known band of musicians known as D-E-A, and their group classes. This also gave a good insight of bhols (the traditional language of Indian percussion instruments). Aman has used music production software such as FL Studio in the past. Which helped to give him a good understanding of rhythm & beats before he learned to play a percussion instrument such as the Dhol. Coming from a family of musicians, Harman was raised with the lifestyle of learning instruments. So now playing the dhol is second-nature to him. He also knows how to play the tabla, harmonium, tumbi, dholak, sarangi and he can also sing. All these talents are continually improving as he practices daily. He has done many instrument performances at Sikh temples and has also done solo singing performances at Melas. ﻿﻿The Punjabi Dhol is perhaps best known worldwide due to its prominent place in the rhythm of popular Punjabi bhangra music. The most popular styles of Dhol playing are Bhangra and Sufi. 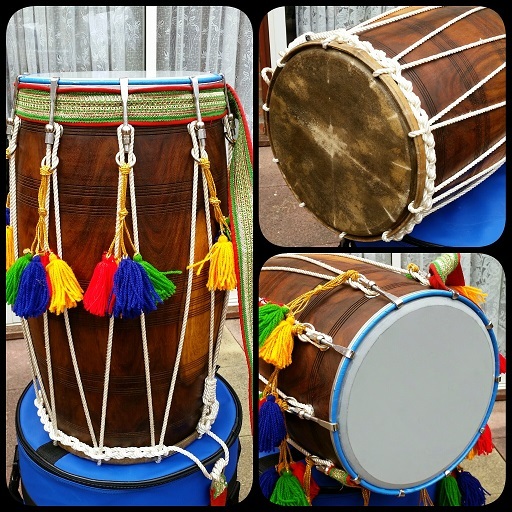 The Dhol is a double-sided barrel drum played mostly at celebrations, festivals or to music. 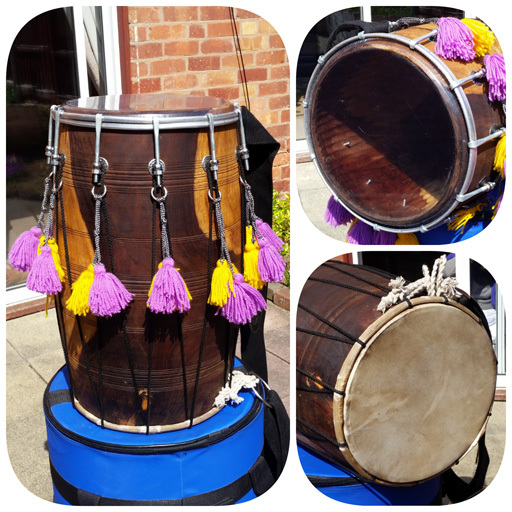 The size of the Dhol remains large to produce the preferred loud sound. Nowadays this drum is constructed of a wooden barrel with goat skin stretched over one side (For the bass kick sound) and a thin plastic drum-head skin on the other side (For the sharp treble sound). Both the treble and the bass sides can be loosened/tightened until the desired tone/pitch is reached with a tightening mechanism made up of interwoven ropes, or nuts and bolts. The treble is struck by a flexible bamboo stick and the bass head is struck by a solid wooden stick. Also a shoulder strap is fitted to the drum so it can be conveniently carried by the drummer while performing.